Taking a good multivitamin is an investment in YOUR health! Time and research change what we know about nutrients and how they impact our health. We've kept the energizing B complex and now have 100% Albion® organic minerals. You’ll find an enhanced B-6 and B-12. Plus the updated antioxidant profile includes CoQ10 and superfruits, since studies show cellular damage and aging are caused by oxidative stress (free radicals). Bioavailable, health building nutrients – just for YOU! Other Ingredients: Cellulose Capsule, Microcrystalline Cellulose, Magnesium Stearate, Silica. Manufactured without wheat, gluten, milk, egg, fish, shellfish or tree nut ingredients. Color may vary. Suggested Use: As a dietary supplement, take 4 capsules daily in a divided dose with meals. Multi-Vitamin Mineral Review: Take it! One of the most prevalent concerns in taking a daily multi-vitamin-mineral (MVM) is figuring out nutrient totals in combination with food intake. A 2017 review of 15 studies that included pregnant women, healthy adults and the elderly should put your worries to rest. The subjects took a minimum of 9 vitamins and 3 minerals with maximum 100% recommended daily allowance with no adverse effects. The study authors conclude that a "MVM can be safe for long-term use". Source: Nutrition 1/17. Could 10,000 Americans be right on track with an MVM? Yes, say Drs. Jeff Blumberg and Balz Frei, lead authors in an August 2017 published study. Taking data represented by 10,000 adults in the National Health and Nutrition Examination Surveys (NHANES), they looked at how a multiple-vitamin-mineral (MVM) impacts nutritional status. Their results show the use of a MVM "at any frequency significantly increased nutrient intakes ... as compared to food alone." Additionally, the authors state, "More frequent MVM use was associated with significantly higher nutrient intakes and lower prevalence of nutrient inadequacies, with these effects being more pronounced among regular users compared to sporadic users." Meaning? Take your daily MVM daily! Why is taking a MVM so important? Let's quote the authors directly as they note, "Micronutrient inadequacies are associated with adverse health effects such as neural tube defects, poor bone health (osteoporosis), impaired immune function, and impaired cognitive function, as well as chronic diseases, such as certain cancers, age-related eye diseases, hypertension, and possibly coronary heart disease and stroke. Low intakes of calcium, potassium, iron, dietary fiber, and vitamin D have been linked in the scientific literature to adverse health outcomes and hence are considered nutrients of public health concern." In other words, disease risk increases when nutrient status is not maintained. Consistent MVM use shows the most drastic benefits. 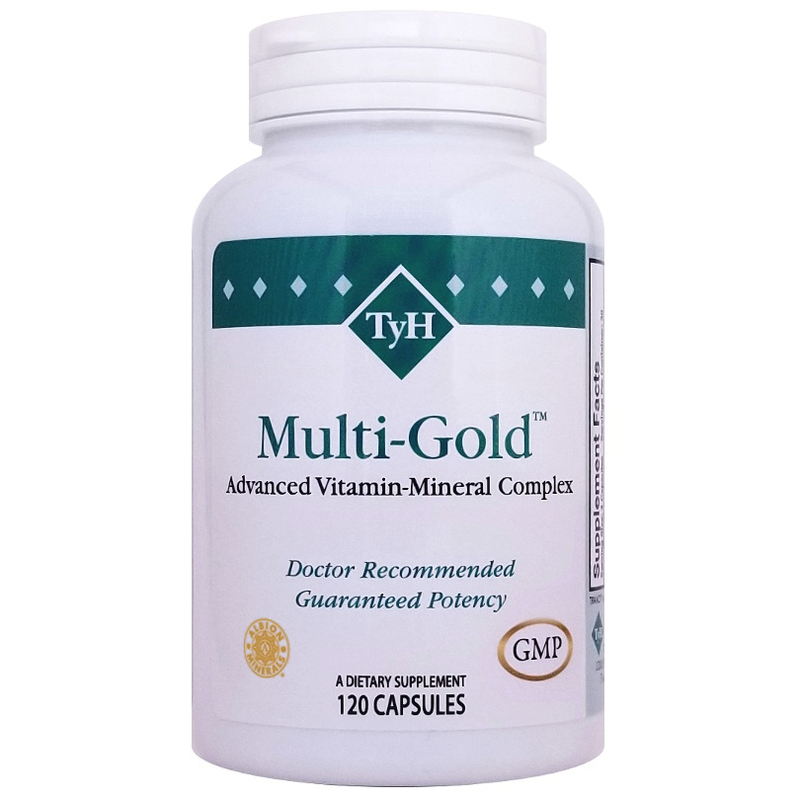 TyH's Multi-Gold™ is packed with 40 health building nutrients, organic minerals for non-competing bioavailability, and contains a wide range of essential antioxidants, and B vitamins. Go for the Gold! Hello, I would love for this message to be seen by David and Margy if possible. I'm a second generation of your product. My mom believed in your product until the day she died. My dad gave me Multi Gold™ and a few other products to try and I'm pain free of my arthritis and fibro. I was seeing an ortho doc for my arthritis and another for my fibro. My ortho doc didn't believe in fibro or supplements. He said if I wanted to waste my money that was up to me. Needless to say I won't see him again. So I was at a loss as to what to do about this pain. I had to buy pain patches I had a refill on and paid $150 for them as I'm on Medicare. Once I started taking the Multi-Gold™ and the other products I was pain free. But I want to order Fibro-Care™ as well. This was just a note to say hello and thank you so much for having the products you have and helping a lot of people through their pain. My dad speaks highly of you both. I won't be able to order for a few days but in the mean time please don't ever stop running this awesome company. I put the Multi-Gold™ to the test, I stopped the Multi-Gold™ and 3 days later I felt like my old Buick running out of gas. I bought a name brand one a day vitamin to try. After a week I had no energy, two weeks, nothing. I went back on the Multi-Gold™ and my order is 2 bottles each order. Multi-Gold™ seems to give my husband and I both, now that I've got him using it, more energy. I like it because it has so many good things in it and covers all the bases. Thank you! My wife and I love the multivitamin, Multi-Gold™. You can tell it is working. As my wife said, I just feel better.